Domain lists are useful for limiting your campaign to run over a specific set of domains (whitelisting). They can also be used to exclude certain domains from your campaign (blacklisting). Within Yieldr Ads, navigate to the domain list creator/editor by navigating to "Tools > Domain Lists". There choose "Create Domain List" and an empty input field will open up. Domains: The domains without http://, http://www., or www. The domains can be separated by line breaks (enters), spaces or commas. A domain list can include up to 25,000 domains. 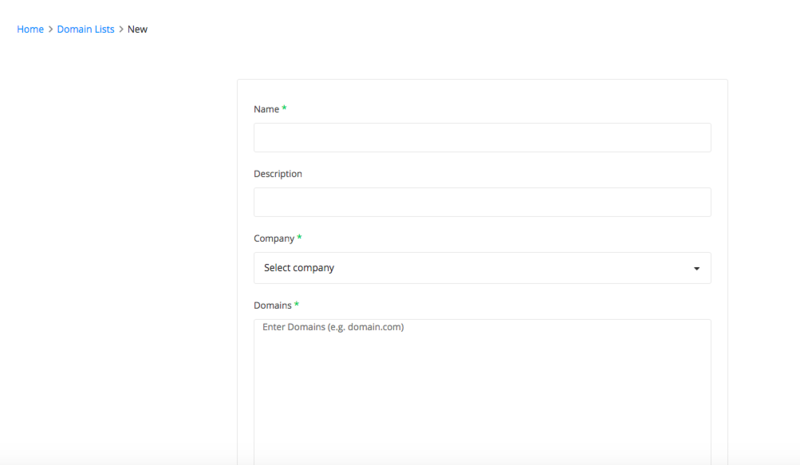 If more are added in the domains field, the group of domains will automatically be divided into multiple domain lists of max. 5,000 domains and numbered successively. Once all preferred domains are added, press save. This domain list is now available under "Targeting Options > Supply" section of your campaigns. When you want to edit an existing domain klist within Yieldr Ads, navigate to the domain list creator/editor by navigating to "Tools > Domain Lists". Select your domain list and choose "Edit Domain List" from the context menu. The input field of the selected domain list opens up. Make your changes and don't forget to press save.